iTunes: https://itunes.apple.com/us/album/azonto-fiesta-single/id589529484 Spotify: https://open.spotify.com/album/1mg4MsqiBfumobQ1BcPJfh Deezer: http://www.deezer.com/artist/605390 Amazon: http://www.amazon.com/Azonto-Fiesta/dp/B00FSTNFFA One of the biggest recent hits in Ghana, where the most successful MC in the country, Sarkodie (https://twitter.com/sarkodie), teams up with the most prolific beatmaker, Appietus (https://www.facebook.com/pages/Appietus/82920871532). Added vocals by rising stars Kesse (https://twitter.com/kesseghana) and Raquel (https://www.facebook.com/pages/Raquel/324148613816). 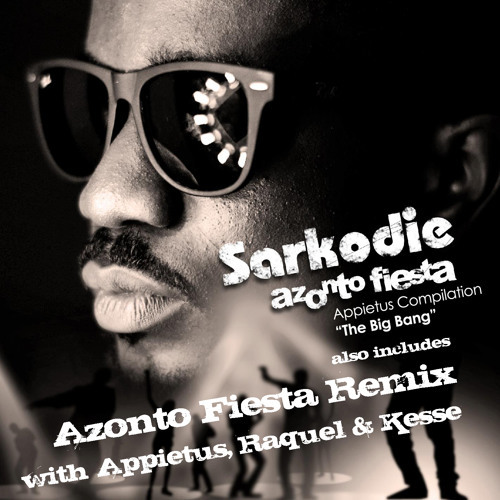 Buy Sarkodie, Appietus & Kesse - "Azonto Fiesta"
Users who like Sarkodie, Appietus & Kesse - "Azonto Fiesta"
Users who reposted Sarkodie, Appietus & Kesse - "Azonto Fiesta"
Playlists containing Sarkodie, Appietus & Kesse - "Azonto Fiesta"
More tracks like Sarkodie, Appietus & Kesse - "Azonto Fiesta"